Regular readers will know that I love Amber, I never tire of how it looks and whilst I make and break bracelets all the time, I *always* have an amber one made up. Recently I discovered I could make another amber bracelet without breaking any of my others up. 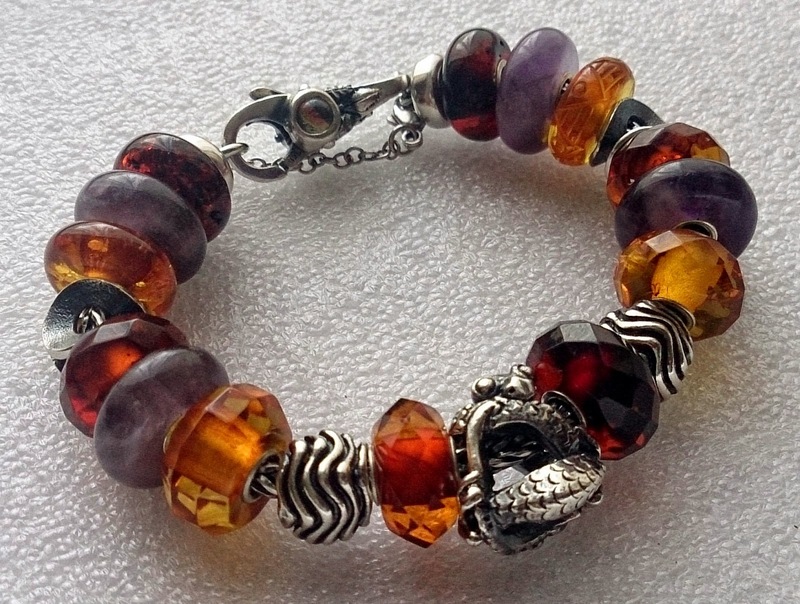 I love mixing amber colours, sizes, designs and textures, which is a good job as the amber beads that were in my bead box are all different, but I was stunned at how co-ordinated and deliberate this bracelet looks! It's been a while since I made my Amber and Amethyst bracelet in March, it hasn't changed in 4 months, not even a little tweak! I now have enough beads to have two full bracelets made up if one is mixed with other beads. Awesome discovery!! That's with still being able to have my Carved Amber Indulgence Bangle and Fantasy Necklace Set made up from May. ...and there's still 3 stray Amber Beads in my bead box to play with... so by my current reckoning of making something amber up every other month, I'd check back in September to see where these 3 end up?! Did I mention I *really* love amber beads?! I would love to have an amber bead with an insect in, but failing that, I want to collect some more of the more opaque light ambers, and I'm always on the look out for unusual shapes! Are you an amber fan? With or without insects? Pop by & let me know! I like the ambers with insects. I have a sweet little ring with a small insect in it. That said, I don't own any amber beads at this time. Well, for one they are rather pricey and I've just started building my collection of european style beads. Love your collection of ambers. How long ago has it been since you bought your first amber? I bought my very 1st amber in June 2011 when Trollbeads released all the World Tour beads globally (before that you could only buy each WT bead in it's own country) - it was Baltic Gold, a faceted amber, part of the Lithuania WT set. At this stage I still don't own any of the "production" ambers, the nearest I have is Baltic Gold, of which I now have 3 and they are all very different sizes! I would love an amber with an insect in, your ring sounds amazing! I still have some of the carved amber designs I'd love to get, but I'm on a bit of a bead diet at the moment so I'm not looking for them currently. Wow amazing video you've shown us there! Bizarrely it reminds me of when I used to be a dental nurse - must be all the drilling and filing that's going on! Lol Mel, that made me giggle! Probably the same reason why I cringe a bit with the sound... at least I can watch the video with the sound off... wish I could do that at the Dentist too!